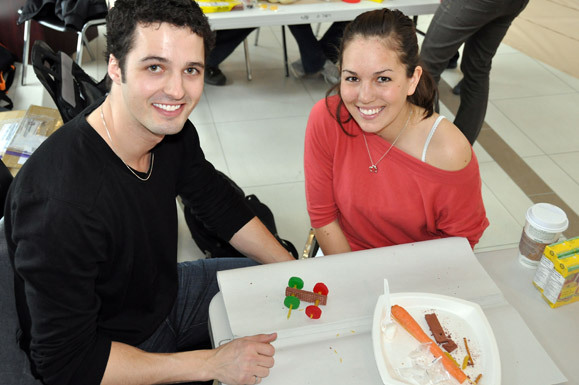 Garrett Hamilton-Smith, community outreach rep for APEGBC, works with first-year engineering student Nicole Israel on an edible car. In celebration of National Engineering and Geosciences Month, the first Okanagan edible car competition was held Wednesday, March 3, in the Fipke Centre Atrium at UBC Okanagan. Students were challenged to design and build moving edible cars using only materials provided on site. The cars were judged on how fast they made it down a ramp and how fast they could be eaten afterwards. Ten bonus points were given for estimating distance or time within 10 per cent of actual result. The team with the longest distance off the ramp was "Car Ramrod" at 348 cm with an eating time of 66.8 seconds. The team that devoured their car the fastest was "Imbattable" at 65.3 seconds; their car travelled 129 cm. "This event offers an opportunity to engineering students to network with engineering professionals and have some fun while using logic and their practical minds to solve a problem," says John Babineau, external coordinator of the Engineering Undergraduate Society at UBC Okanagan. The edible car competition was hosted by the Association of Professional Engineers and Geoscientists British Columbia (APEGBC) Okanagan Branch. "While it is a fun and unusual competition, there are some fundamental ideas in the competition that link to work in the professions represented by APEGBC, such as planning, design, teamwork, creativity and time management," says Chris Ptak, a professional member of APEGBC. "The idea of the edible car competition is to stage an event for a variety of people to apply some basic engineering ideas in a fun environment." This is the first year the edible car competition was held at UBC Okanagan, although there is a history of similar competitions at schools around Canada and the U.S.